Swaying palms, salty breezes, golden rattan cane, sweet grapefruit. With essential oils. That’s an interesting mix of fragrances. Smelling the wax, I detected a fresh sort of green aroma. The swaying palms and salty breezes maybe? That’s my guess. Grapefruit? I didn’t smell any citrus. All in all, this was an interesting and fresh scent I wasn’t quite sure what to make of. Before I delve more into the fragrance, I first need to say – cute candle! Loved the label! 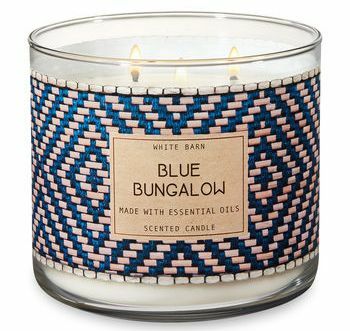 The label completely wrapped around the candle and was a beaded blue and white weaved pattern design with embossed detail and a matching woven metal lid. It had a sort of nautical feel to it and I thought it was very well done. See picture above. I lit this candle in my master bedroom to start out and that’s where it stayed till the very end. Once the wicks were lit, it took the average 20 minutes to reach a full melt pool and the aroma… honestly, I have no idea. The fragrance smelled fresh but I still didn’t smell a lick of grapefruit so this scent had to be the swaying palms, golden rattan cane and salty breezes – whatever all that smells like. Seriously folks… the aroma drifting through my bedroom smelled fresh and I liked it but I couldn’t tell you what it smelled like other than a fresh kind of perfume scent. This is just one of those fragrances you’ll have to sniff yourself to see what I mean. Strength – I would rate this scent an 7 out of 10 in a really large room. 10 in medium to smaller rooms. This candle burned great. No wick issues. YES!! Clean burning from beginning to end. Even though I couldn’t explain what this fragrance smelled like for you, I can say it was fresh, clean and a scent I would recommend to those who love fresh/clean types of fragrances. My suggestion… smell this candle next time you’re in a Bath & Body Works store and see what you think.